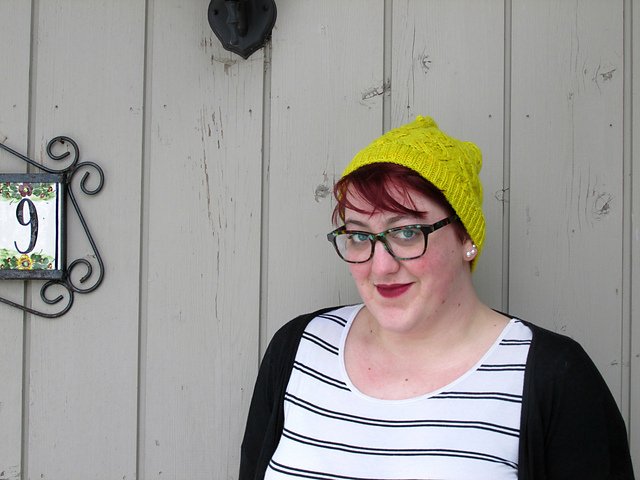 The Wayward Knitter: I'm Back! Hello, friends! I am back and I had an amazing time in the cities. My friends and I watched cheesy 90's movies, did arts and crafts, ate pizza, went to the Arboretum, and all sorts of other shenanigans. It was a really great trip, and I got quite a bit of new knitting done. I brought two new projects with me, so I'd have an easier one and a more challenging one. This is my easier project: a crop top version of Drift. As soon as I got past the yoke on my first Drift, I knew I wanted a short sleeved and cropped version. I mentally assigned this yarn to it pretty quickly-it's Colinette Jitterbug, and I had a skein and a half sitting in my stash waiting for destiny. The half skein is quite a bit darker than this full skein, so once I get to the stockinette part I'm going to start alternating them so I don't end up with a big colorblock. 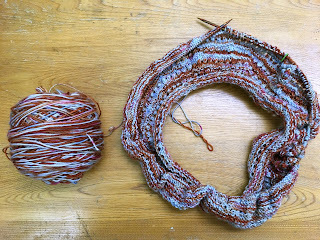 I have about two more repeats in the yoke left on this, and once I get to the underarms it will go really quickly. Every year at the end of winter I start craving more warm-weather knits, so it'll be nice to have this ready for summer. Since I'm back home now, my little Drift Crop Top will have to get put on the back burner while I finish Chaverim, but it's such a charming little knit that I hope to be back to work on it very soon. So glad you had a fun weekend! saw your painting on instagram, looked amazing!